4 Bb or C 1 10th fretfr. optionalopt. 1 C 1 8th fretfr. 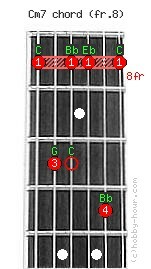 Chord Cm7 (8th fret) notes: C, G, Bb or (C), Eb, Bb and C.
This chord is played by placing a barre on fret eight with your index finger. The note C on the fourth string is not required, but can be played on the 10th fret if needed. C minor 7th guitar chord's alternative names: Cmin7, C-7.